Earlier this week, outgoing Greek Finance Minister Yanis Varoufakis rode away on a motorcycle after resigning his office in a dramatic blog post. He was a combative leather-clad rebel who was called a “rock-star” by some. 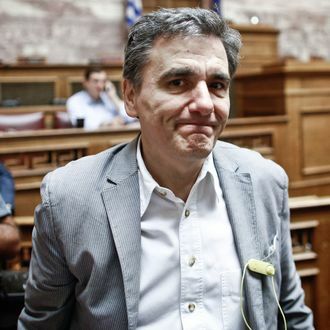 And his replacement was the “soft-spoken” Euclid Tsakalotos, a professor who prefers corduroy to leather and was expected to be a much less flamboyant representative for Greece. But then Tsakalotos showed the world his signature and made it clear that like his bird-flipping predecessor, he has an affinity for obscenity. His John Hancock is below.